I like to think that we inspired Julia Gillard… A month ago, in Mackay, when the now PM graciously opened our new Technology and Information Resources Centre we encouraged her to seize the moment and be what she wanted to be…. Despite, or perhaps in spite of these and other unknowns, I’m resolved that CQUniversity determine its own future; that we seize the moment, as it were, and go where we want to go and be what we want to be. Clearly – after talking to people all over the uni for the last 10 months and people outside the organisation who have an interest in our development – all of us we want to be of more service to our communities and have more mutually beneficial relationships with individuals and organisations in the places in which we live and work. For now, we’ll continue down this path and I’ll keep you posted on our progress. Stay tuned. As we know, thing can develop overnight…. That’s sage advice, I think. There’s no doubt that the higher education road ahead will be pock-marked with “under construction” signs, with more on-and-off ramps being built, increased areas of merging traffic , and more Driver Reviver spots installed as the Australian government moves to increase traffic flow, accommodate different vehicles and enable more “drivers” to access higher education during their education journey. The fork ahead of which I write, however, is not a fork that diverges and directs traffic in separate ways. My GPS tells me it’s not a bypass or a run-around, but a different pathway that could extend our University beyond its main part; adding, developing and multiplying what we do to enable more Central Queenslanders to get where they want to go and be what they want to be. The term used in Australia for this structure is dual sector higher education, which I believe, will become more common and desirable among Australian universities. Five universities already operate in this fashion (Charles Darwin, Swinburne, RMIT, Ballarat and Victoria University.) And dual-sector seems, to me, an area in which federal and state governments, given common goals of increased access and participation, would welcome more activity. Think of it as a cross-over uni – our University could be more flexible, less conventional and better tuned for the evolving work requirements and lifestyle of Central Queenslanders. Dual sector means we could give more Central Queenslanders manoeuvring in and out of careers more optimism, more options, and more opportunities. And, if you excuse the continuing automotive analogy, we could put more, better-skilled drivers on the road. So, what makes a dual sector entity? The five I mentioned here teach and have large numbers of students in each Vocational Education & Training and Uni – some hovering around 50/50 in terms of student load; they conduct research and they offer awards up to PhDs. Other universities, too, have offered vocation-level educational programs for decades including English language preparation, on a smaller scale. There are different models too, here and overseas, in which traditional VET providers and private operators offer degrees. To some extent we operate in this space around the fringes, through partnerships with other organisations, our own enabling programs and Pathways, the federally funded projects designed to get people into mining careers based at Gladstone and Mackay. Professional Development, an area in which we operated in years ago (Direct Edge) is back on the agenda, too. Move from being a multi-campus university to a multi-city university. Campuses in Mackay, Bundaberg and Gladstone must be developed. They will move from being feeder campuses to being campuses on an equal footing with Rockhampton – delivering to the needs of their communities. 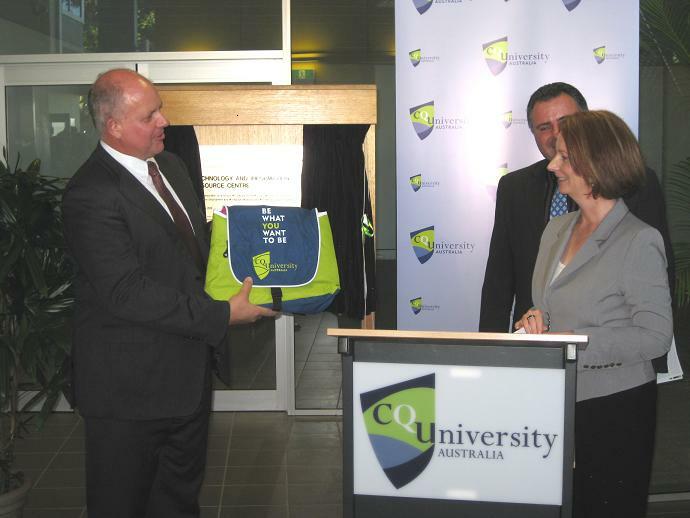 Promote engagement at all levels – until CQUniversity becomes known as Australia’s most engaged university. I have no doubt that we will be working more in the dual sector space. How we make that transition and what forms a ‘real’ dual sector university in Queensland are unknown factors at this time and areas which we are exploring. We’ll be looking to our colleagues at other institutions, consulting with government and community stakeholders and learning more from each other as we discuss the challenges and opportunities that dual sector presents. One option I don’t see is us pulling off the highway and onto the shoulder to watch the traffic go by.